Kaiya Beach Resort, located along Florida's iconic Scenic Highway 30A, sold out of its initial residential offerings just hours after their release. "Kaiya offers an extraordinary lifestyle filled with carefully curated amenities, services and experiences." 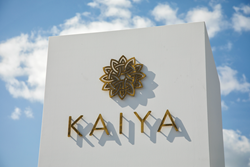 Kaiya Beach Resort sold out of its initial villa offerings during the Kaiya Founders Release on June 23. A highly sought-after location coupled with spacious, open floor plans emphasizing the villas’ seamless indoor/outdoor design helped drive demand for these luxurious residences. These first three owners will be the community’s first homeowners and founding members of Kaiya Club, a members-only organization offering unmatched concierge services and a host of incomparable owners-only experiences. Among the many selling features of this elegant 30A community are The Beach House and The Inn, which will serve as the living room for the community and feature fine and casual dining, select boutiques and an intimate cinema. Reservations are now underway for the next release of residences. The Mews cottages will offer owners convenience and privacy with a spectacular array of community amenities. With half of the next release already reserved, this next offering promises to be an exceptional addition to Kaiya Beach Resort. Architects and urban designers Erik Vogt and Marieanne Khoury-Vogt have worked with Kaiya owners Jason Romair and John Pinkerton to create this highly anticipated, one-of-a-kind community along Florida’s Scenic Highway 30A. The Sales Studio at Kaiya is open Monday - Saturday 9 a.m. to 5 p.m. and Sunday 10 a.m. to 4 p.m., and is located at 9247 East County Highway 30A, Inlet Beach, FL 32461, directly west of Alys Beach. To learn more about Kaiya and available ownership opportunities, visit KaiyaBeachResort.com or call the Sales Studio at call 850-588.3076.